I like Montana, and from what I’ve seen, I like it a lot. The Lolo Pass area didn’t disappoint. What fun I had hiking and poking around in the footsteps of Lewis & Clark, the Nez Perce Indians, and countless other American Indians who used this area to get from the salmon bearing Idaho side to the buffalo bearing high plains side that is Montana and Wyoming. With my time here being as limited as it was I dashed like a mad woman from trail to trail and from historic site and historic campsite to the next. I can’t wait to come back and spend a good deal of time exploring…perhaps next summer. And Missoula. I like Missoula, though I only saw it for a brief moment. It sits at the confluence of 5 river valleys and is said to be the cultural hub of Montana. It is a college town with a thriving downtown area boasting a multitude of outdoor cafes and coffee shops etc. It is my understanding that it is also an unusually literary town with scads of writers and writer wannabes both past and present, not to mention its thriving arts, music, theater, and film programs and venues. They even have a Festival of the Book every September, which apparently attracts several thousand people. 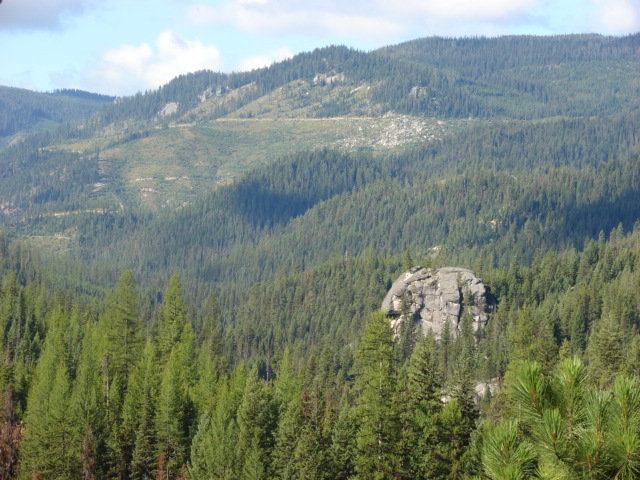 AND perhaps best of all, this entire package is surrounded by lovely hills and mountains, clean air, clear rivers and streams, hiking/skiing trails galore, and is spitting distance from Glacier and Yellowstone National Parks. What more could a gal want? Oh, and the speed limit is 70 (sometimes 75) and for those who know me, know I love this too! The drive here from Glacier was about 175 miles and took me past Flathead Lake, the largest natural lake west of the Mississippi. It is 28 miles long and up to 15 miles wide. This morning, I am headed toward Yellowstone, which is just over 200 miles to the East and I’ll be driving on a major interstate for the first time in Dora….speed limit 70. I’ll stop somewhere around Big Sky, which a huge ski resort with a town attached (which came first? I don’t know) before heading into Yellowstone the next day. It was 33 degrees this morning and is expected to be another sunny day reaching into the low to mid 80’s. What wonderful diversity! 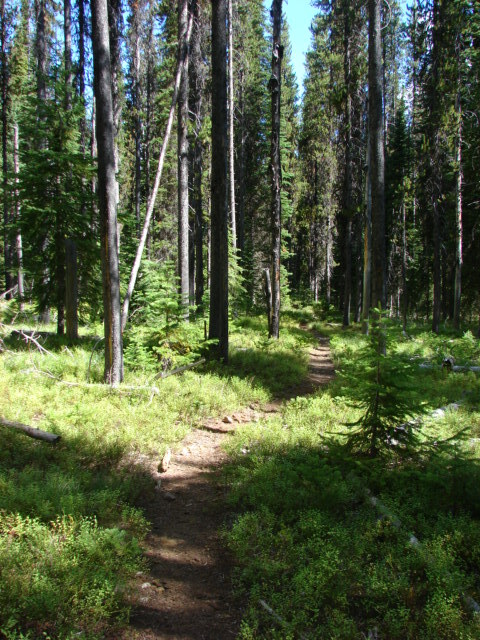 I stayed about 6 miles north of the Lolo Pass at the Lee Creek Campground. Lewis & Clark passed through this area on their way West on September 11, 12, and 13 of 1805. At that time, there was already snow in the mountains. That’s just a few weeks from now. Here are some shots taken while here. This first one was taken during a hike out an old logging road from the campground. I kept seeing these big blobs of granite while hiking and finally learned what they are called. Each is a batholithe. Say it out loud and see if you don’t laugh. Batholithe. I crack up every time I say it…who knows why….maybe because it makes me feel like I have a lisp. Batholithe. See, there I go again. Batholithes are big blobs of granite that have slowly pushed themselves up through the earth’s crust like an air bubble rising in a jar of honey, at least that’s what I read. Moving on. Here is Dora at the Lolo Pass Visitor Center. 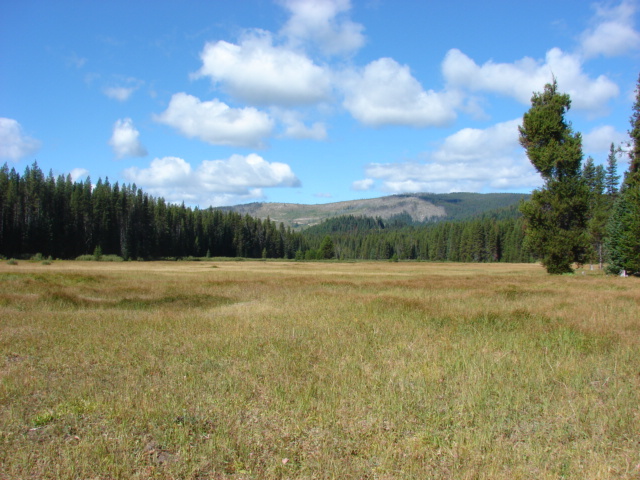 This is Packer Meadow about a mile from the Pass. The Lewis & Clark Expedition stopped here on their way west. This was also a popular resting area for the numerous Indians traveling back and forth across the Pass. 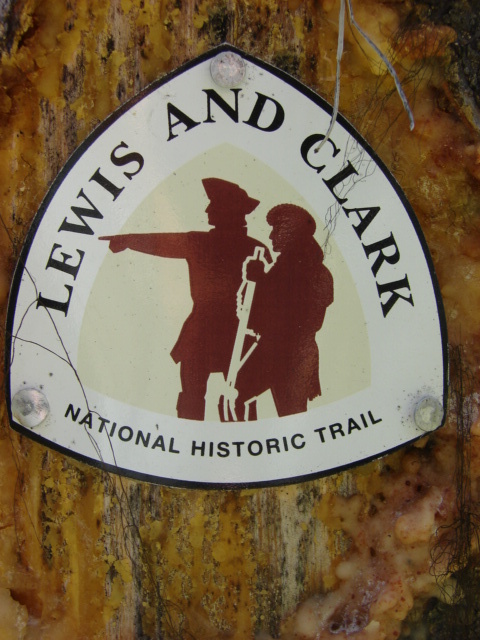 And this is a trail marker from the Lewis & Clark Trail, which in this area is the same as the Nez Perce Trail. And finally a shot of the Lewis & Clark Trail not far from Packer Meadow. The thing I noticed most about hiking in this area were all the pine trees. There were so many different kinds, Lodgepole, Ponderosa, Douglas Fir, Cedar etc. It smelled like Christmas all the time. So cool Merge. You will probably get to see more of YellowStone then I did. Hope you get to see Ole Faithful. You have to hit Colorado in your adventures. Beautiful out there. One area I went to had plenty of those pushed up rocks but they were red and orange. Wonder if they are related? Hi to the kids. Be safe and enjoy. A thought just came upon me. I have heard the Grand Titans are something else too? I believe Montana? Just a thought. I must say, I’m impressed with your knowledge of the different types of pine trees. Love the pictures, as always, especially the one of Dora in her lovely topstitched skirt (of course you can’t see it from the picture, but I know it’s there!) Drive safely, Missy!